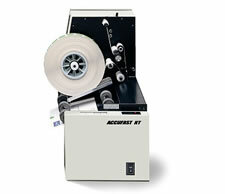 The Accufast KT and KT2 are similar tabbing machines. The main difference is in the added tabbing head on the Accufast KT2 allowing it to apply either 1 or 2 tabs. High productivity. The shortest dimension feeds through the machine increasing production rates at any given speed. Simplicity. Short paper path with no skewing adjustment etc. Accuracy. Tabs fold tight to the edge of the piece and do not drift from left to right. Ideal for off line application.